The Fresh Air Ventilation system is designed to introduce fresh air into a home through an intake damper controlled by a micro-processor logic panel. The iO-FAVR-ENHANCED has single adjustment setup, exhaust fan control option, outdoor temperature and/or humidity limit option and damper override capabilities. It is easy to install and meets ASHRAE Standard 62.2. 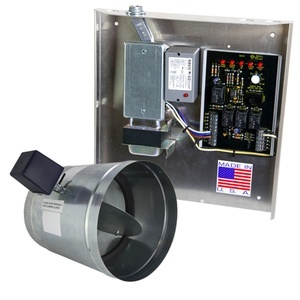 Kit comes with preassembled control panel wired with 20VA transformer, relay to energize an exhaust fan, gang box for line voltage separation and 6” damper.